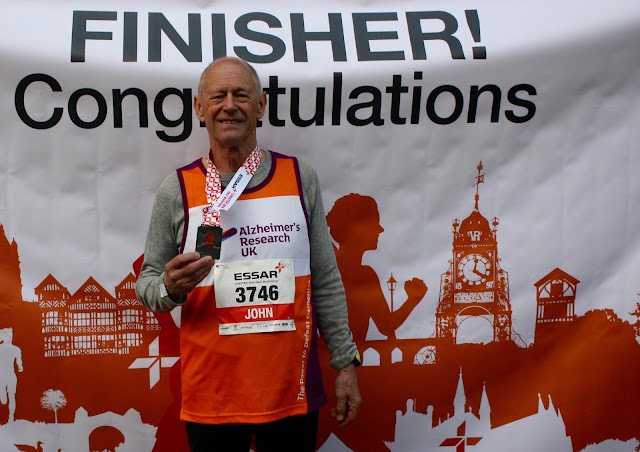 * John Palmer celebrates his Chester Half Marathon success. Last Sunday Llangollen septuagenarian John Palmer completed his first half marathon in Chester in 1hour 59 minutes. John was raising money for Alzheimer’s Research, his wife Lyn having been diagnosed with dementia a little over five years ago. In September last year John and his son Nic were no longer able to care for her at home and she is now looked after by the lovely staff at Llangollen Fechan. John and Lyn met at Chester Teacher Training College, now Chester University, over 50 years ago and after a very happy life together John wanted to help find a cure for this awful disease.